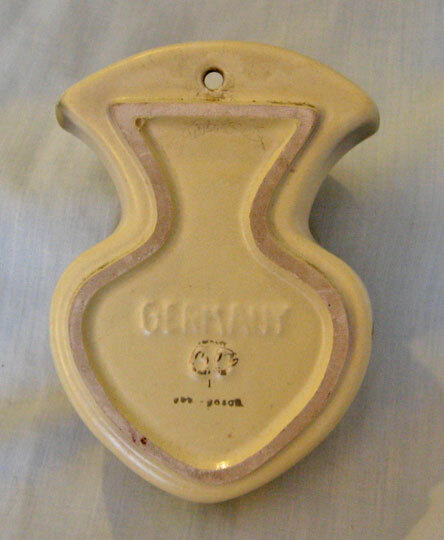 This mid century German pottery wallpocket was made by Jasba, probably in the late 1950s. At first look, the decor appears to be an uncommon variation on the Jaspatina glaze, but that's not quite accurate. 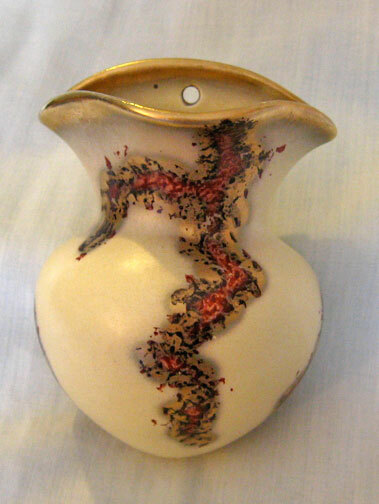 The primary glaze is cream or beige with the red glaze evidently sponged on to create a mottled effect that allows some of the underglaze to show through, and this mottled area is outlined in gold. The patterning of the decoration looks like Jaspatina, but the gold decoration is airbrushed, not fired like the gold in Jaspatina. Shape number is 60. Most gold-rimmed items from this era are airbrushed since it's a much easier method. This is probably a special line, possibly made under contract for a particular outlet, designed to be a lower cost version of their own line. Size: Height is about 4 1/2"
Price: $35 plus shipping and insurance.